Oklahoma - who doesn't love this show? I've seen it several times, including once at the Ordway with my favorite Duke, John Schneider, as Curly. The King and I - I've never seen it on stage, and only bits and pieces of the movie. Carousel - another one I've never seen and would love to - calling all local musical theater companies! South Pacific - I saw the 2008 Broadway revival starring Kelli O'Hara, Paulo Szot, Matthew Morrison, and Danny Burstein, and it was one of the most amazing musical theater experiences of my life, an all-around luscious production with a 30-piece orchestra and a huge and energetic cast singing this amazing and diverse collection of songs. The Sound of Music - this one is so familiar to me I almost forget it's Rodgers and Hammerstein. I've loved it since I was a kid, and that love only increased when I was in the pit orchestra for my high school production, and later lived in Salzburg for a semester while studying abroad. Rodgers and Hart's first big hit, a love song to New York City, "Manhattan," performed by Joel and Jennifer. Two songs from my favorite Rodgers and Hammerstein score, South Pacific, Josh's lovely rendition of "Some Enchanted Evening" and Joel's emotional "This Nearly Was Mine." Two gorgeous Rodgers and Hart songs that have become classics, sung beautifully by Connie ("My Funny Valentine") and Josh ("Blue Moon"). A couple of entertaining and funny songs by Kirby - "Johnny One Note" from Rodgers and Hart's Babes in Arms and "I Cain't Say No" from Rodgers and Hammerstein's Oklahoma. Jennifer's sad and lovely rendition of "He was Too Good to Me." A trio by the three women, "Sing for Your Supper" from Rodgers and Hart's The Boys from Syracuse. I was fascinated to learn that "You Could Drive a Person Crazy" from Company (playing at the Ordway next month) is an homage to this song. One of the greatest musical theater songs ever written, "Soliloquy" from Carousel. It's such an ambitious (and long!) song with a wide range of emotions and tempos, and Josh sings it beautifully. A fabulous montage of favorites from Rodgers and Hammerstein's immense catalog of fabulous songs, including "Oh What a Beautiful Morning" (the first song they wrote), "Edelweiss" (the last song they wrote), "There is Nothin' Like a Dame," "Younger than Springtime," "Lonely Goatherd" (inserted for comedic effect), "Bali Ha'i," "Oklahoma," "Surry with the Fringe on Top," and "Sound of Music" (which gets me every time). Kudos to James and Denise and whoever else had a hand in arranging this medley; it very cleverly weaves together many diverse songs. My only complaint about this show is that it's too short! It's truly astonishing to contemplate the hundreds of amazing songs that came from the collaboration between these three men. The show could go on for days! But since that's not very practical, this is a nice representative sample of their work. 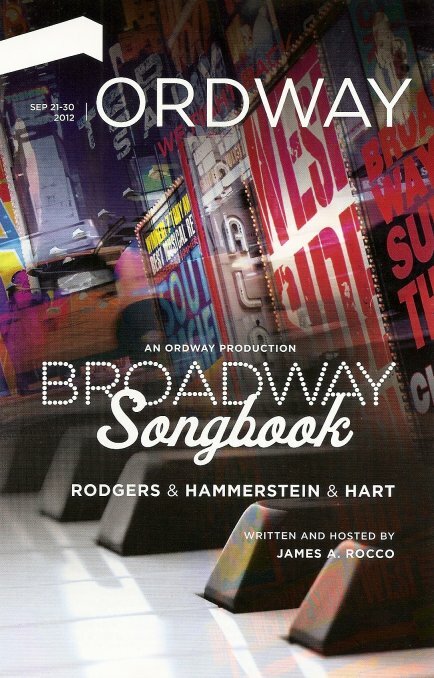 Broadway Songbook: Rodgers & Hammerstein & Hart plays at the Ordway's McKnight Theatre through the end of the month. 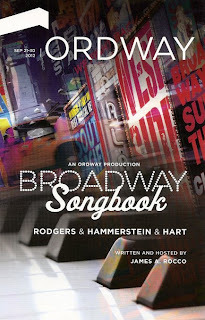 Check it out if you're interested in a fun and entertaining lesson on three musical theater legends. If you don't already have tickets, call the box office. It's virtually sold out, but they might be able to squeeze you in somewhere. Get your tickets early for the January session, which features the music of Steven Sondheim.